Floods due to destruction or damage of damming structures. Determination of areas with potential flood risk was aimed and identifying all the places where any problem of flooding was identified based on available data. Due to the nature of flood types, determination of potential flood risk was slightly different for each type. When determining areas with potential flood risk when it comes to river floods due to natural swelling, areas with the risk of flooding at 1% (and, potentially, with a different probability of flood occurrence when there was not data on the risk of flooding and 1%), historical flooding areas, areas potentially at risk of flood in accordance to PFRA from 2011, as well as floodplains (natural retention areas) were taken into account. River floods to water transfer or the destruction of flood embankments were analysed in the same way as in the case of river floods due to natural swelling. 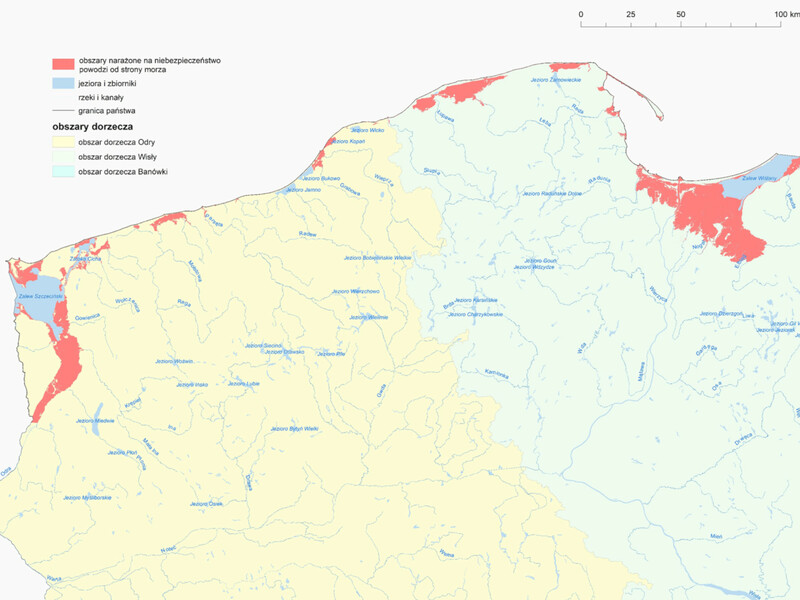 The main source for identifying areas potentially at risk of flooding were areas with the probability flooding at 1%, determined on the scenario of total destruction of the existing embankments. 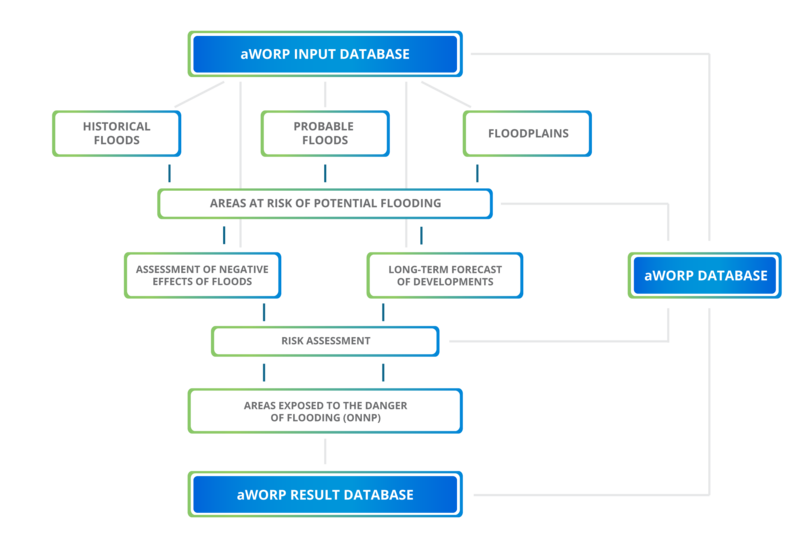 The basis for the determination of potential flood risk in the case of winter river floods due to blockage was available information on historical and probable floods due to blockage. This information was not available to determine the range area of potential risk of flooding due to blockage. 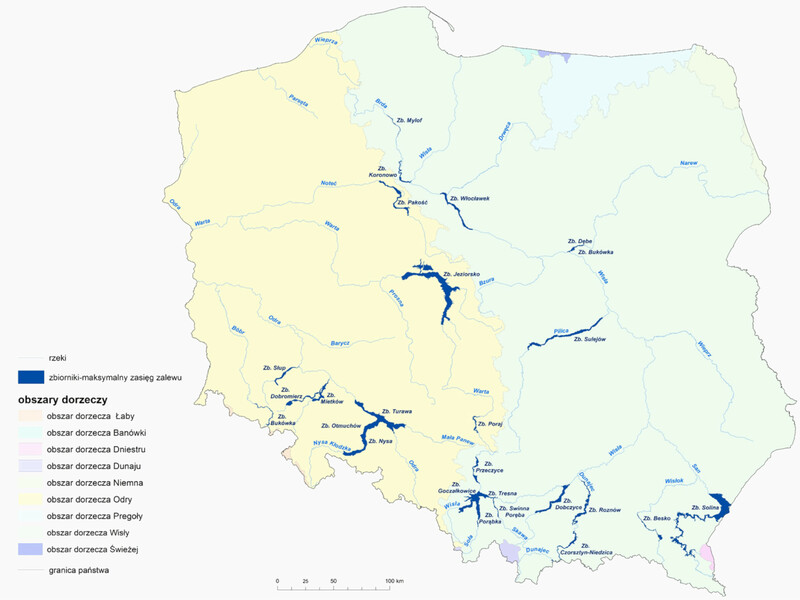 The basis for information on potential risk of flooding in the case of rainfall floods was the identification of historical floods carried out on the basis of data on fire-fighting interventions in the years 2010-2017 in the 39 largest cities in Poland, where the population exceeds 100 000 inhabitants. areas at risk of undercuts from groundwater – associated with the risk of flood due to raising groundwater table. areas at risk of undercuts from down flowing water – this risk of undercut is directly dependent on geological, morphological and anthropogenic conditions. When determining areas of potential risks of flooding when it comes to onshore flooding, we included areas where the risk of flooding is at 1%, including floods caused by failure of embankments, areas of historical floods and identified areas at risk on the sea side due to the anticipated climate change. there are ranges of flooding due to failure designated under other projects. The maximum range of flooding caused by failure to the embankment was considered the flood range. Determination of areas with flood hazard – on its basis, areas characterized by high flood risk, i.e. APSFRs, were distinguished among areas with potential flood hazard. A spatial unit with potential flood hazard was classified as APSFRs based on the sum of points derived from the criteria. Direct sum was applied for the current state criteria. When it comes to the perspective changes criteria, the percentage change for the sum of points for the current state was used. In addition, the analysis included the surface area of drainage basin – APSFRs include only those watercourses where the surface area of drainage basin ≥ 10km2 (i.e. major watercourses – uniform areas of surface water according to the Framework Water Directive). These were analysed in the same way as in the case of river floods due to natural swelling. Due to poor information about historical and probable floods, insufficient to designate areas with potential flood hazard (as well as assessment of the adverse effects of flood and long-term prognosis), APSFRs for winter river floods due to blockage was not designated. Due to the inability to clearly carry out spatial aggregation of point data about rainfall floods and due to the nature of such floods, APSFRs was not designated. In order to designate APSFRs, we adopted a solution based on the analysis results for specific areas at risk of flooding due to groundwater and flooding water was adopted – aggregation of the results of both analyses gives a picture of the actual, cumulative risk in a given area. Onshore floods, including from maritime internal waters, were analysed in the same way as in the case of river floods due to natural swelling. APSFRs designation was based on the determination of categories according to which APSFRs classification was made for structures with people permanently or periodically present. Each category of structures was assigned a threshold number of structures above which an area was classified as APSFRs – areas of flooding due to failure of embankments, which met at least one criterion, were classified as APSFRs. APSFRs for river floods due to natural swelling and river floods due to transfer or destruction of flood embankments. 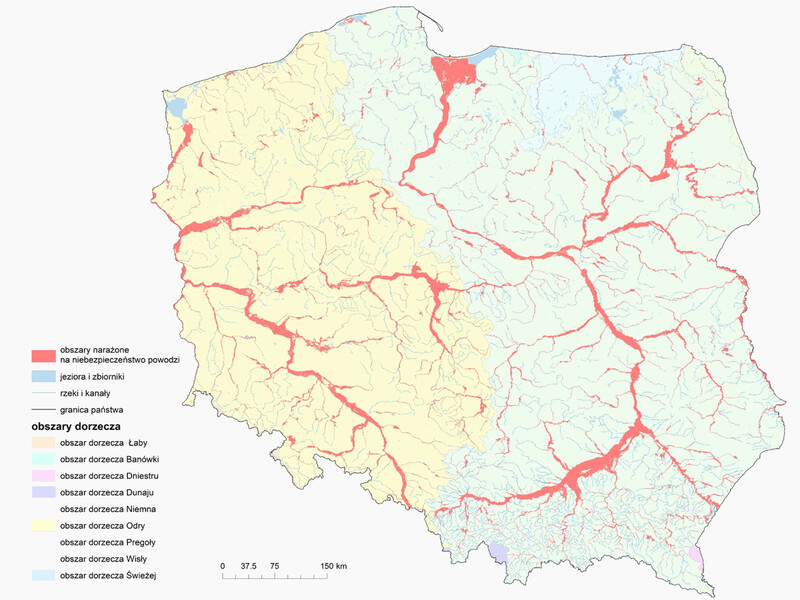 APSFRs for onshore floods – onshore APSFRs, as well as from maritime internal waters, designated for entire Polish coast. In addition, all nearby sea drainage basins are APSFRs. APSFRs for floods due to destruction or damage of damming structures – 25 dammed reservoirs with damming height of more than 10 m were designated as APSFRs.